Compared to serial robots, parallel kinematic manipulators are stiffer and can reach higher speeds and accelerations. However, their control is troublesome because of the complex mechanical structure, highly coupled joint motions and many other factors (e.g. clearances, assembly errors, etc.) which degrade stability and accuracy. Many research papers focus on the control of parallel mechanisms (see Jean-Pierre Merlet website for a long list of references). It may be possible to bypass the complex kinematic structure of the robot and to apply a form of control which uses an external sensor to estimate the pose of the end-effector, reducing the stability and accuracy degradation mentioned earlier. A proven approach for estimating the end-effector pose is through the use of vision. The most common approach consists of the direct observation of the end-effector pose. In some cases, however, it may prove difficult or unwise to observe the end-effector of the robot, e.g. in the case of a machine-tool. A substitute target for the observation must then be chosen and an effective candidate for this are the legs of the robot, which are usually designed with slim and rectilinear rods. When moving the object of observation from the end-effector to the robot legs, the result of the observation becomes a direct measure of an internal property, i.e. the kinematic configuration of the robot. In addition, as the information is acquired through an external sensor, this technique allows to estimate indirectly the pose of the end-effector from it which is an external property. An application of this technique was performed by Andreff et al. who used vision to derive a visual servoing scheme based on the observation of a Gough-Stewart (GS) parallel robot. In that method, the leg directions were chosen as visual primitives and control was derived based on their reconstruction from the image. 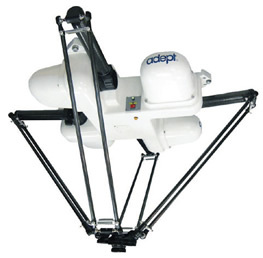 The approach was applied to several types of robots, such as the Adept Quattro and other robots of the same family. In some cases, the robot did not converge to the desired pose, even if all observed leg directions did. This was surprising, since the whole idea of using an external sensor is to get the exact position of the end-effector. Are we sure there are no local minima (for which the error in the observation space is non zero while the robot platform cannot move) in the Cartesian space? 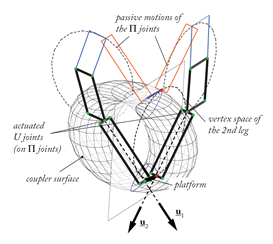 Are we sure that there is no singularity in the mapping between the leg direction space and the Cartesian space? Due to the unusual nature of this visual servoing technique, all these points were left unanswered. It was clear that this behaviour was due to the mapping between Cartesian space and the leg direction observation space, but at this time the nature of the mapping was not understood and there were no tools available to analyse correlation between the intrinsic and extrinsic properties of the controller. The answer came only recently, when the existence of a virtual robot model ``hidden'' within the controller was proposed. 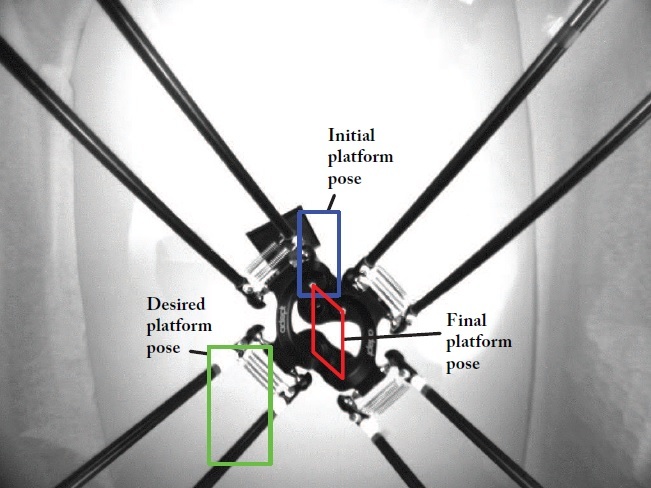 This robot presents singular configurations and assembly modes different from the controlled robot, and it is this hidden robot whose intrinsic and extrinsic properties are being used through the observation of the real robot's leg directions. S. Briot and P. Martinet "Minimal Representation for the Control of Gough-Stewart Platforms via Leg Observation Considering a Hidden Robot Model, "Proceedings of the 2013 IEEE International Conference on Robotics and Automation (ICRA 2013), May 6-10, 2013, Karlsruhe, Germany. where the visual servoing of the leg directions of the GS platform was proven to be equivalent to controlling the hidden 3-UPS, respectively (Fig. 1). A similar property has been shown for the control of the Adept Quattro for which another hidden robot model, completely different from the one of the GS platform, has been found (Fig. 2). Fig. 1. The GS platform and its hidden robot model. Fig. 2. The Adept Quattro and its hidden robot model. In both cases, the hidden virtual robot is proven to be a tangible visualisation of the mapping between the observation space and the real robot Cartesian space, correlating the external and internal properties observed through vision. 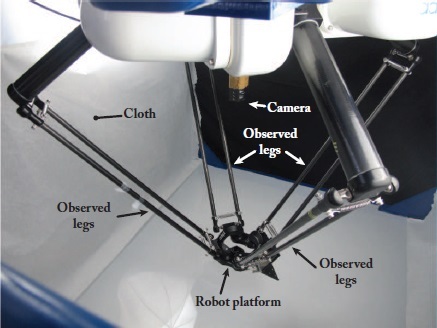 Considering this hidden robot model, a minimal representation for the leg observation-based control of the studied robots can be found, which makes it possible to answer the previous questions. Thus, the concept of hidden robot model, is the tool able to analyse the intrinsic properties of some controllers developed by the visual servoing community, without which the behaviour of the controller cannot fully be explained. Moreover, this concept shows that in some visual servoing approaches, using only the extrinsic properties and stacking several interaction matrices to derive a control scheme without doing a deep analysis of the intrinsic properties of the controller is clearly not enough. Further investigations are required. 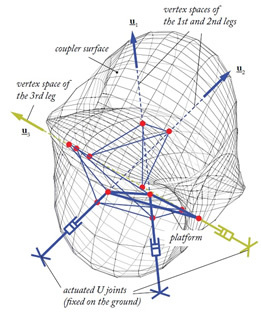 V. Rosenzveig, S. Briot, P. Martinet, E. Özgür and N. Bouton, "A Method for Simplifying the Analysis of Leg-Based Visual Servoing of Parallel Robots," Proceedings of 2014 IEEE International Conference on Robotics and Automation (ICRA 2014), May 31 - June 5, 2014, Hong Kong, China. Experimental results made on the Adept Quattro (Figs. 3-4) validated the theory.